In rare cases, special software configurations may cause an unforeseen behavior of the software, a so-called exception. 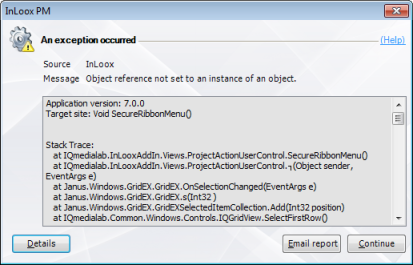 If an exception occurs while you are working with InLoox PM, you can notify the InLoox support team via the message box that will pop up. This message box was specifically developed to provide detailed information on the unique software configuration and helps in finding the best solution. Please find below information on the communication options in case of a software exception. 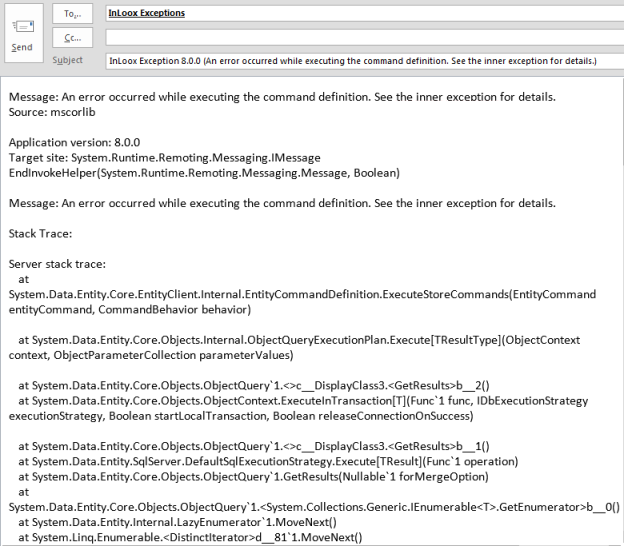 The message is automatically generated and includes detailed information on the specific, unforeseen exception that occured. This information helps our development team to define the underlying technical issue and make future software versions even more stable. To find out more about the information compiled in the exception report, click on Details. You can, of course, also directly contact our support team via phone. If you prefer calling in, please have the information provided in the exception dialog box handy. For detailed information on the contact options and direct phone lines, please go to Contact the InLoox PM Support Team. Software exceptions and support | InLoox PM 8 • Copyright 1999-2019 © InLoox, Inc. All rights reserved.